The New England Machinery, Inc. Rotary Cap Applicator is the answer to unreliable in-line cappers. The NERCA aligns caps perfectly every time. No crocked or skewed caps again. 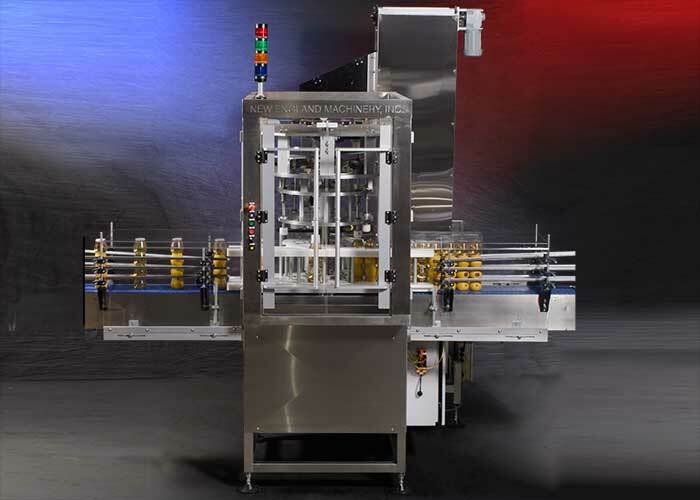 THE NERCA continuous motion, rotary device precisely places screw caps onto threaded containers and engages the threads before releasing the cap and container from the applicator. Create a Rotary Cap Placement System – combine a NERCA with our Retorquer (NEPMT). Combine the functions of cap sorting, cap feeding, aligning and cap tightening in one system. The containers enter the lower star wheel, are aligned directly below the caps and caps are placed directly onto the containers and rotated until the threads are engaged.